From the beginning, bath time brought up a lot of feelings for our little girl. 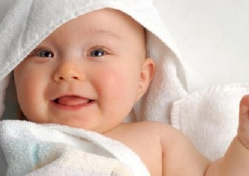 She cried reliably during and after every bath for the first 6 months of her life. Early on, this was stressful for my husband and I. Bath time was not the enjoyable and bonding experience we had hoped for or heard about! Then, we came across the work of Aletha Solter and learned about the stress releasing function of crying. Over time, it became clear that when our baby cried during and after bath time, she was simply releasing stress from a long day or letting go of feelings from earlier times which were challenging for her. So many experiences are new, confusing, overwhelming, frightening and upsetting for new babies and some level of upset is inevitable, no matter how hard we try to be gentle in our parenting. They are learning to live life outside of the womb, which is very different to life inside the womb. The amazing thing is, that babies and children are built exquisitely to adapt to their new world and one way they do this, is by crying to help them work through and recover from overwhelming feelings and every day experiences, including the really challenging ones. They use crying to help them work through the difficulties and challenges that come with being so new to the big wide world. And so, we learned to trust that when our little girl cried during and after bath time, she was not hungry, she was not needing to sleep right then, she was not needing a cuddle (as she cried even when we held her close for ‘cuddle breaks’ during her bath time), she was not sick, there was nothing ‘wrong’… She was crying because she needed to cry, to clear out the feelings that were preventing her from enjoying bath time. We did several things to help her and ourselves through…. My husband and I bathed her together, almost as if for moral support. We allowed bath time to take as long as it needed to take, we did not rush as rushing can add more fear and overwhelm to a situation, which leads to more feelings to be processed and released. We bathed her every few days or once a week so as not to overload ourselves. We slowed bath time right down. We washed her body very slowly. We washed her body parts in a similar order every time. Before washing each body part, we primed her nervous system by saying ‘we are going to wash your legs now, get ready, legs…’. We stopped to accept and listen to her crying during and after her bath. When she was very little and she began to cry during bath time, we stopped washing her, picked her up, held her and listened while she cried. We did not rock her or jiggle her to stop her crying (to ‘soothe’ her), we did not try to divert her attention away from her crying. We trusted she was simply doing what she needed to do to help herself feel better so we tried to remain calm and listen to her. We poured love in, however we could and we trusted her crying would come to an end soon enough. We would from time to time say things like ‘we know bath time is hard, it will be over soon’ and ‘we’ve got you little one, we got you mate’ but mostly we would just listen. When she was older, closer to 6 months, we did not always need to pick her up when she cried during bath time. We did however always move close to her and cuddle her or put a hand on her shoulder or tummy, while she lay on her bath aid. We made sure to offer eye contact to her, to reassure her that although it felt really hard, all was well and we were right there with her helping her through. One of us listened to her cry while the other gently continued washing her. After her bath, we wrapped her in a towel and sat on the couch holding her while she continued to cry for as long as she needed to. She would cry with great intensity for around 15 minutes and sometimes much longer, especially when she had not cried much during the day. Eventually she loved the bath! From when she was 6 months old it seemed as though a switch was flicked. She no longer needed to cry during or after bath time and she suddenly LOVED and genuinely enjoyed it! We were absolutely over the moon, finally!! And even though she cried a lot during the first 6 months of bath time, it was an incredibly bonding experience to help her through this difficult time. Thank you for writing this fantastic article Emma.